Here are 5 things you can do to get your horse back on his feet after a bout of colic. Watch the droppings. Even after the horse looks comfortable, keep a close eye on the state of his manure. Any change from normal consistency, color or content should be noted; extreme changes, or those that last more than a day after the colic, warrant a call to your veterinarian. Although the horse may not show colic signs, the abnormal manure indicates that his digestive system is still out of sorts. Forget the grain. Withhold all grain for at least a day, or until his stools look normal. Then return him to his regular feed, starting with just a fraction of his normal grain ration. Gradually increase his grain back toward normal, while observing him closely for trouble signs. Provide plenty of forage. 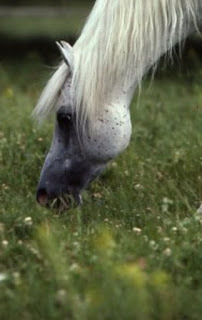 You can allow a mildly colicky horse to graze as soon as he feels up to it. Grass is easy to digest and palatable. You may also allow him unlimited access to hay if his droppings remain normal. Turn him out. The movement and selective grazing of continual turnout get a horse's gut moving faster than stall rest. Check on the field-kept horse often to be sure you don't miss signs of returning pain. This fun, simple-to-set-up exercise strengthens your (and your horse’s) jumping technique and improves your track-riding, striding and balancing skills. Looking for a fun, easy way to strengthen your position and improve your jumping rounds? 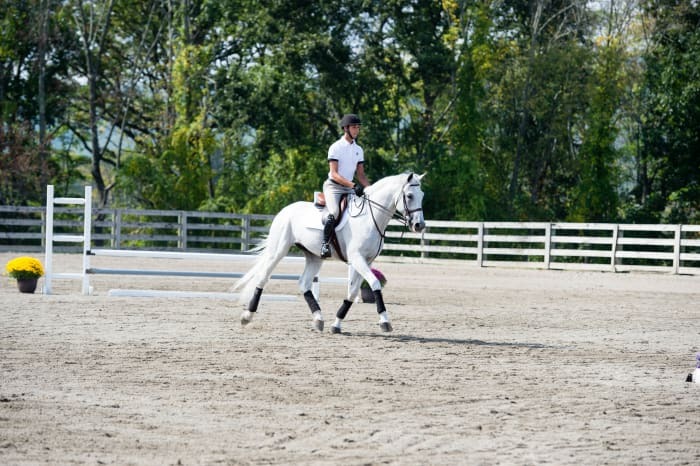 My hourglass exercise is simple to set up and beneficial for any riders with at least some experience cantering small courses and jumping bounces (no-stride combinations). Shaped like an hourglass, with a double bounce in the middle and bending lines to four single verticals in the corners, it will develop and strengthen your basic position and make you a more effective, reactive rider. 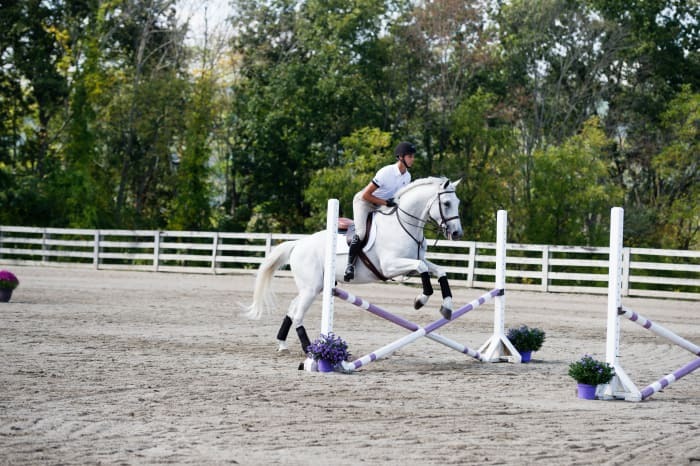 For example, when your horse jumps into a line on a too-forward stride, you’ll be better at correcting that quickly on the back side of the jump. The hourglass will also hone your skills for track riding, measuring stride length and balancing your horse. At the same time, it will enhance his jumping technique, tightening his front end and strengthening his hind end while improving his straightness, adjustability and rideability between the fences. For collegiate athletes, who essentially compete at shows as catch riders, this exercise will improve your ability to build a rapport with unfamiliar horses in a short amount of time. You’ll learn how to develop the trust and confidence essential for successfully bonding with new horses. 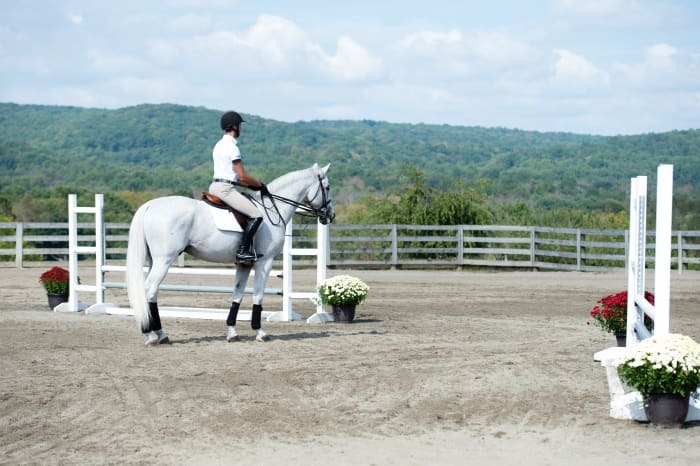 One of the best qualities of this exercise is that it challenges riders of different levels in different ways. As I walk you through the steps, I’ll point out the questions it poses for Novice, Intermediate and Open riders (the Intercollegiate Horse Shows Association divisions for riders jumping 2-foot to 2-foot-3, 2-foot-6 to 2-foot-9, and 2-foot-9 to 3-foot, respectively). Whatever your level, it’s critical that you approach the exercise step by step, just as you would with any other gymnastics. Instead of planning to get through the entire lesson in a single day, break it down into easy-to-accomplish steps and confirm that you’ve achieved confidence and proficiency at each before moving on to the next one. Also keep in mind that making progress is not about jumping big fences. You can achieve much more and also reduce the pounding on your horse’s legs by practicing well-thought-out exercises over small jumps. For this hourglass exercise, I keep both the jump heights and the distances fairly conservative. 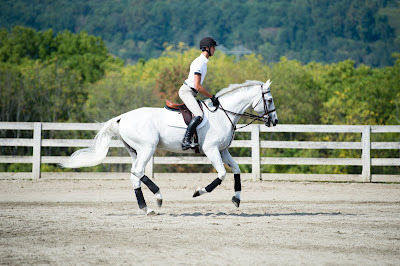 This encourages horses and riders to focus on good technique rather than fall into the bad habit of galloping through the course and getting long and flat. This is when your entire seat (seat bones and buttocks) are in the saddle, providing maximum connection to your horse's back. It offers the most balance and control, which can be especially useful for rollback turns, lead changes, etc. In this position, which is between the full seat and the half-seat, your seat bones make light contact with the saddle, but the rest of the backside is still clear of it. This is basically the same position you have during the sitting phase of the posting trot. While offering you some support, it still allows your horse to move freely forward. Much of your riding will be done in this position. Your weight is balanced on just the two points of contact between your legs and and the horse. We use this seat to follow the horse's motion- for example, over a jump - and to encourage him to utilize his body as freely as possible. To set up, study the diagram below. Build a double bounce out of three small crossrails in the middle of the arena on the centerline, separated from one another by about 10 feet. (You can adjust this distance to as short as 9½ feet if your horse has a very short stride or to as long as 12 feet if he has an especially long stride.) After the third crossrail, build a simple vertical 60 feet away on the diagonal to the left. Build another vertical at the same distance on the other diagonal to the right. Add ground lines on both sides of each vertical. I like to keep these verticals simple—no need to fill them with walls, flower boxes, etc. You’ll ride only half of the hourglass pattern in this first exercise and it may take you more than one session to accomplish all the steps. If you are a Novice rider, this is all you’ll need. 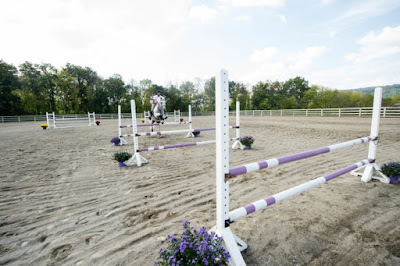 If you’re an Intermediate or Open rider, build two more verticals on the approach side of the crossrails, 60 feet away on the diagonals, so that you create a mirror image of the first two verticals. Set all of the fences so that they can be jumped safely in both directions—and be sure you have plenty of room on the far sides of the verticals to make comfortable turns between them. If your arena is too small to do this, eliminate one of the crossrails, converting the double bounce to a single bounce. If you’re a more advanced rider, you can change the crossrails to verticals. You could also build this gymnastic in an open field, lengthening the lines between the double bounces and verticals to a standard five- or six-stride distance (72 or 84 feet, respectively). For riders of all levels, I strongly recommend having a ground person on hand, not just for safety’s sake, but also to reset poles and adjust the distances as necessary. Before beginning the exercise, do a thorough warm-up on the flat, getting your horse in front of your leg (responding obediently to your leg aids). Include both longitudinal exercises—lengthening and shortening the stride in all three gaits—and lateral exercises—circles, serpentines, etc.—to supple your horse’s entire body. If you’re more advanced and familiar with leg-yield, turn on the haunches, shoulder-in and haunches-in, do a few of these in each direction. As you warm up, review your four natural aids: legs, hands, seat and voice. Be sure to use all of them for both upward and downward transitions. (One of my favorite questions to ask students who say their horses aren’t listening to them in downward transitions is: “Were you using all four of your natural aids—or just your reins?”) Also practice the three seats you’ll use during this exercise: full seat, half-seat and light seat. (For a more detailed explanation of these, read the “Know Your Different Seats” photo gallery above). Spend a little time on each seat in each gait. Centenary University student Michael Andrade turns Norway onto the centerline in a forward, active posting trot. About 10 feet away from the first crossrail, he stops posting and settles into his light seat. With his eyes up, he’s careful not to tip his upper body forward toward the jump. Because he is an experienced rider, Michael uses a shorter crest release than I’d expect a Novice rider to use. Even so, he’s careful to keep his hands in place on the neck over all three crossrails so Norway can concentrate on doing his job. After the bounces, Michael sinks his weight into the saddle and his heels, lifts tall in his upper body and uses all four natural aids to initiate a downward transition to halt. Norway responds obediently, coming smoothly down to the halt in between the two verticals. They hold the halt for 4 to 6 seconds. 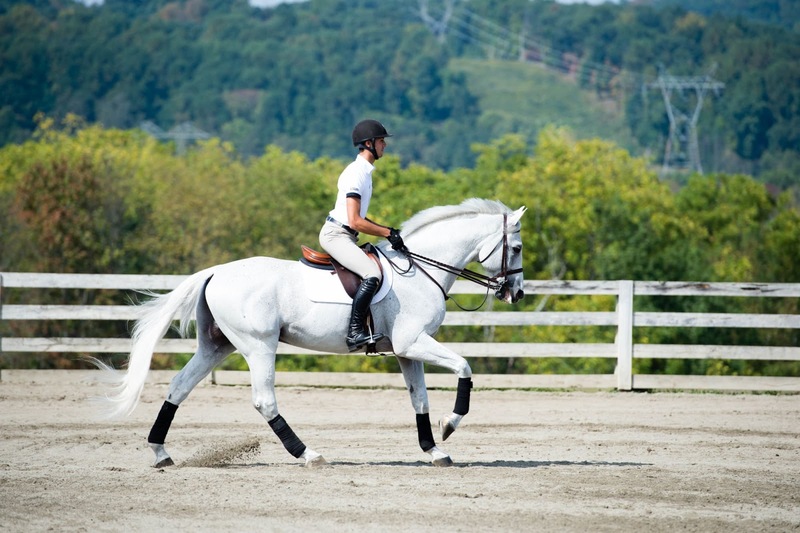 If you are a Novice rider cantering small courses proficiently, this exercise will improve your ability to stay with your horse’s motion over fences without interfering with him in any way. You’ll also learn how to reorganize after a fence in time to approach the next one straight and in control. You’ll ride only half of the hourglass pattern, but that will still give you plenty to do. In fact, it may take you more than one session to accomplish all the steps. That’s fine! Always progress at your own pace. This exercise requires a strong base of support (a well-positioned lower leg and deep heel) and lots of core strength (strong abs and back muscles), so if you feel yourself begin to tire at any point, end on a good note and save the rest of the exercise for another day. In the meantime, add more two-point practice into your regular schooling sessions to build up your strength. Set the crossrails about 2 feet high and the verticals between 2-foot and 2-foot-3. If your horse is green or has trouble with straightness, turn the two verticals into crossrails. If you have never jumped a double bounce before, take the poles out of the first crossrail for the beginning of the exercise, replacing them with a single ground pole about 9 feet from the next crossrail. After you’ve done the single bounce comfortably a few times, put the first crossrail back in. Start by turning onto the centerline and approaching the crossrails in a posting trot. About 10 feet away from the first one, assume your light seat by lifting some of your weight up out of the saddle while still maintaining light contact with your seat bones. Check that your lower leg is securely positioned at the girth with your heels directly below your hips and your weight down in your heels. Lift your eyes to a high spot in the distance—the top of a tall tree or, if you’re indoors, the top of a window or other visible object. 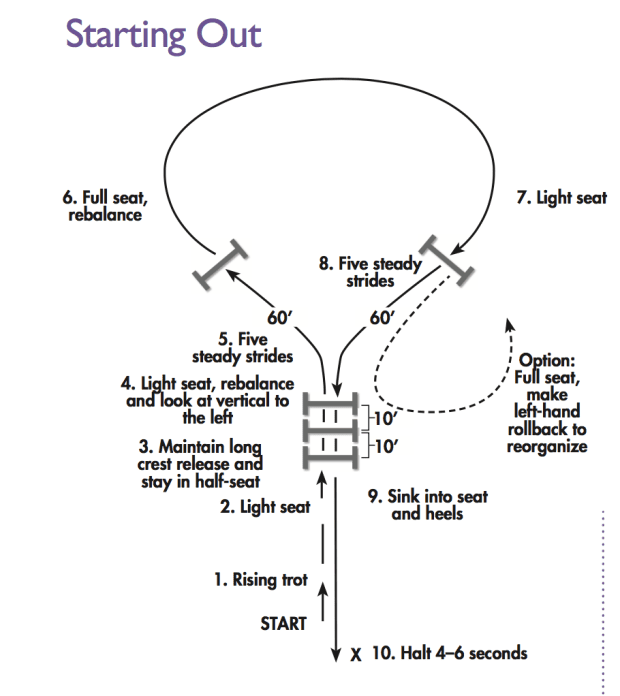 As your horse takes off over the first crossrail, allow his motion to close your hip angle into a half-seat. Meanwhile, smoothly follow his motion with a long crest release, pressing your hands down against his mane about halfway up his neck. No hands floating above the neck! Maintain this release through the double bounce while keeping your eye on your focal point and staying in your half-seat, letting your hip angle open and close with his motion. Concentrate on staying down in your legs and keeping your weight in your heels. This is very important. Don’t be tempted to sit up or interrupt your rein release in between the crossrails. Wait for him to land all four feet on the ground after the final crossrail before sitting up and feeling the rein contact again. At this point, it doesn’t matter if he lands trotting or cantering. Either way, keep him straight on the centerline while you reorganize and reestablish your own balance. Then drop your weight in your heels and seat, get very tall in your upper body and use all four natural aids to ask him to come smoothly down to a halt. Ideally, the halt should be straight on the centerline, right between the two verticals, but don’t worry if you don’t get that exactly right the first time. It’s more important that you and your horse stay relaxed and positive from beginning to end. Ask him to hold the halt for 4 to 6 seconds, just as you would for an equitation test. 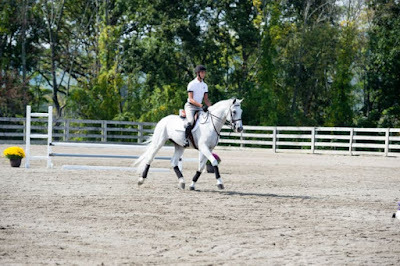 Then move forward again into the trot and make a wide, sweeping turn back to the centerline so that you approach the bounces in the opposite direction. Ride through them just as you did the other way, asking him to come down to a halt on the straight line again afterward. Repeat this a few times until you feel confident over the bounces and your horse is responding obediently to your aids. It’s essential that you establish this rideability on the back side of the fences before moving on to the next step. Now you’re ready to add one of the verticals. Approach the crossrails in the same way as before, only this time, as you ride through them, turn your focus to the left-hand vertical. After your horse lands from the final crossrail, return to your light seat, lift your upper body tall and stretch your heels downward. Then follow a gently bending track to the center of the vertical. In the show ring, this 60-foot distance would typically ride in four strides, but because the jumps are low and the bounces tend to have a compressing, buoyant effect on horses’ canters, this should ride in a quiet five strides. Over the vertical, apply your crest release and go into and out of your half-seat slowly and smoothly—rather than jerking abruptly into and out of it. Again, allow your horse to complete his jump before sitting up. Then drop the weight into your heels and seat and use your legs, weight and voice in conjunction with your arms and hands to ask him to halt straight on the diagonal track before you get to the corner. This will reinforce the earlier lesson of halting after the double bounce, reminding him to always land and wait for your next signal. Don’t worry about what lead he lands on at this stage. Just try to maintain it until you ask for the halt—in other words, try not to let him anticipate the corner and swap leads automatically. This, too, is good prep for equitation tests. Repeat this a few times until you can maintain a steady rhythm from the bounces to the vertical with five strides of approximately the same length. If you have trouble fitting in the five strides, stay more on the outside track (ride a wider curve between the bounces and vertical) to make more room. If you’re still not managing the five, remove all of the poles from the crossrails and vertical. Then place one ground pole between the standards of the vertical and one between the standards of the third crossrail. Practice cantering over these poles, riding as curved a bending line as necessary to produce five—or even six—strides. When that’s going well, replace the jumps and ride the line again. Don’t be afraid to circle whenever you feel your horse rushing. He must be rideable before continuing. Once you are competently navigating the bounces, vertical and halt, prepare to ride the same exercise without the halt, continuing through the turn instead. 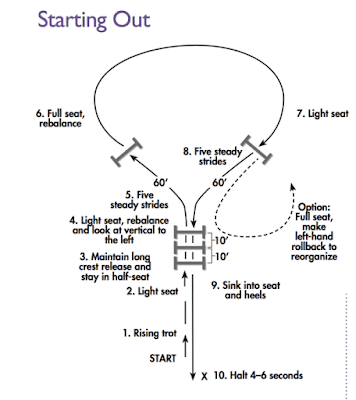 To reorganize and balance your horse properly for the turn, sink back into your full seat after the vertical. If your horse landed on the left lead and is properly balanced and educated, he should do a flying change. 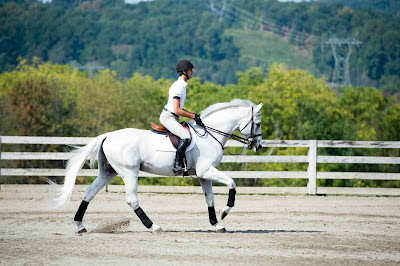 If he’s not balanced or is green, do a simple change of lead through the trot. Take your time to organize and do it well. Slow down to trot, take a deep breath, then ask him to go forward on the right lead. In the intercollegiate world, simple changes are perfectly acceptable—so long as you do them correctly. Keep the rhythm consistent around the turn, using plenty of space to ride a nice smooth track. If your horse feels balanced coming out of the turn, go to your light seat and aim for the center of the other vertical. If he doesn’t feel balanced or starts to rush at any point in the exercise, make a circle. Remember, the goal is to do each part of the exercise in balance and control. 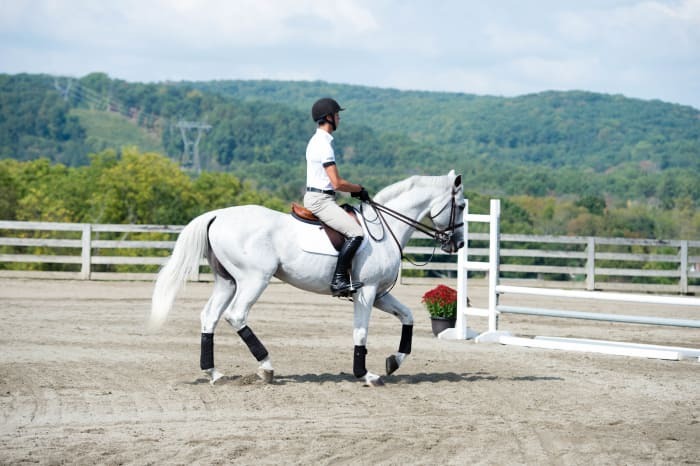 After the second vertical, if your horse doesn’t feel rideable enough to continue on to the bounces, drop into your full seat and make a left-hand rollback turn to the rail. Repeat this a few times to teach him not to anticipate the next part of the exercise. When you feel comfortable and in control after the second vertical, continue cantering on a bending line back to the bounces. As you did before, sit up tall in your light seat and ask for five steady strides. At this point, your horse, having figured out the exercise, might make a beeline for the bounces, trying to get to them in four strides. Be ready for this. Drop your weight in your heels and think of leaning a little away from the bounces. You might even need to ride a wider shape to fit in the five strides comfortably. This is a great lesson in effective equitation. It takes a lot of core strength and balance to create the right outcome. 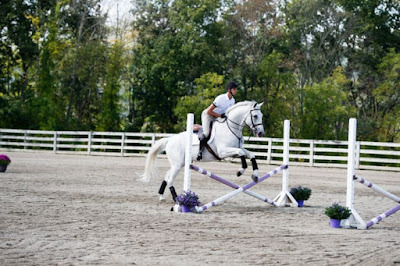 After riding through the bounces, ask for another straight halt on the centerline before you reach the end of the arena. Then give your horse—and yourself—a pat for a job well done.